This section summarizes the results of the input collected, with a particular focus on the cross-cutting recommendations made by the stakeholders in all three groups. The 21 recommendations are grouped into three categories: (1) recommendations for further exploration, (2) recommendations that are being addressed by existing work, and (3) recommendations beyond the scope of the National Plan. The specific recommendations appear in bold and related information about federal activity appears below them. The following ten recommendations were identified by the Task Force as having the potential to be addressed through federal activities, pending the availability of resources. Stakeholders assert that the National Plan needs to address and incorporate strategies that are culturally and linguistically appropriate. For example, detection tools need to be created and defined as valid (or not valid) for specific populations. The federal staff updating the National Plan will review the document to identify opportunities to address this recommendation. Further actions undertaken in the annual updates to the National Plan will seek to address this concern. Addressing this gap would help meet the need for information and service of an increasingly diverse population. Non-governmental groups may be effective in determining approaches to detection of Alzheimer's disease. OMH has been engaged in this effort. Stakeholders say that primary care practitioners have insufficient training to recognize symptoms of possible dementia and to refer people with such symptoms to experts for an accurate diagnosis. Furthermore, practitioners should have access to this training. This is an area for potential action through the Geriatric Education Centers (GECs), which provide interdisciplinary geriatric education and training to health professionals and others students. The GECs received supplemental funding in FY 2012 to provide inter-professional training on Alzheimer's disease and related dementias. In FY 2013, grantees will integrate information on specific populations into public and private provider awareness and training efforts. Both Comprehensive Geriatric Education Program (CGEP) and Geriatric Training for Physicians, Dentists, and Behavioral and Mental Health Providers (GTPD) programs could be asked to enhance outreach to primary care providers, as many of the current grantees offer significant amounts of continuing education related to dementia. Stakeholders assert that the Alzheimers.gov website should increase availability of culturally appropriate resources for multiple communities, in addition to the resources already available in Spanish. With future funding for Alzheimers.gov, there may be an opportunity for public-private partnerships to develop culturally appropriate resources to address this need. The OMH Resource Center may be engaged as consultants in developing translations and content. Reflecting the needs of our diverse society, languages beyond English and Spanish are important to the public seeking information about Alzheimer's disease. The OMH has provided expertise and sensitivity on cultural appropriateness to create and translate information on a range of health issues. In addition, it may be useful to consider public-private collaborations to address this need. Health Resources and Services Administration (HRSA) will be posting Alzheimer's disease assessment tools in multiple languages from its GEC grantees on its dementia website in FY 2013. Stakeholders say that protection and advocacy networks nationwide do not have sufficient information regarding advanced care planning and options counseling for persons at risk of dementia and their families and that such information should be made available to these networks. The Task Force believes that this information should be disseminated, even more broadly than the existing protection and advocacy systems for people with disabilities. In addition, the information disseminated should be broader than advanced care planning and options counseling. Additional information needed by all of the specific populations includes: care settings and financing, protection from abuse and neglect, options counseling for services, legal decisions, spiritual and religious preferences, and end-of-life planning. More tailored efforts to address the specific needs of the populations will likely be needed and may involve partnerships with the private sector. One example of a private sector effort is the ABA's work on younger-onset legal issues and future planning. Stakeholders say that specific populations are not aware of, nor are they enrolled in, clinical trials in sufficient numbers; stakeholders recommend that clinical trials procedures address this. Minority enrollment in clinical trials has historically been low, with traditional recruitment efforts not reaching these populations. Although rules to ensure broader minority enrollment in clinical trials are in place,8 enrollment of these populations remains low. Similarly, stakeholders, including clinicians and family members of people with Down syndrome, reported no awareness of ongoing clinical trials for this population. The National Institute on Health (NIH) is addressing this recommendation through the National Plan, with the National Institute on Aging (NIA) and the Food and Drug Administration (FDA) taking the lead on the National Plan's Action 1.B.3.9 Increased public awareness of governmental efforts directed to stakeholders and health care providers nationwide may increase knowledge of clinical trials in which specific populations are enrolled or eligible. The GEC funding mentioned in Recommendation 2 requires that the continuing education programming provided by the GECs include information on clinical trials. The grantees are encouraged to educate health care providers about both local trails and national trials that are listed on the NIH website. Stakeholders assert that persons under age 60 with dementia and their caregivers do not have access to benefits counseling, legal assistance, nutrition programs, transportation, in-home services, case management, ombudsman access, adult day care, and respite. Stakeholders recommend that these groups have access to these types of services. Although the Task Force does not have the authority to expand the availability of these services to younger age groups, the group sees the potential to enhance awareness about the services to which these populations already have access. For example, persons under 65 with disabilities have access to home and community-based services (HCBS) through Medicaid and state-funded programs; the National Long-Term Care Ombudsman program serves all residents of nursing homes, board and care homes and assisted living facilities; the State Health Insurance Program serves adults of all ages who have Medicare due to disability. Legal services programs are available to people under age 65. Stakeholders are concerned about screening and detection of Alzheimer's disease among specific populations. Stakeholders also say that practitioners do not receive reimbursement for provision of regular screening for early symptoms of dementia for younger persons and those with intellectual disabilities and recommend that practitioners' reimbursement should be adjusted to address this. Addressing changes in reimbursement procedures for practitioners is beyond the scope of the Task Force. However, the development of assessment tools for people with intellectual disabilities is underway in the private sector. Task Force members were not aware of public or private funding for such tools. Awareness among providers of services to persons with younger-onset dementia may be part of future provider outreach/education efforts. We do not yet know what screening tools are effective for people who may be experiencing younger-onset dementia. Identification of tools being developed externally would be a possible next step. Stakeholders point out that another specific population that does not appear in the National Plan is people with co-morbidities involving both behavioral health conditions and dementia. The Task Force appreciates this recommendation and is reaching out to relevant agencies such as Substance Abuse and Mental Health Services Administration (SAMHSA) and the National Institute of Mental Health (NIMH) to determine what additional work is needed. Many of HRSA's GECs are providing education and training in the management of multiple chronic disease conditions. The two most common chronic conditions they produce trainings on are dementia and diabetes. CGEP and GTPD grantees are specifically focusing on geropsychiatry, with an emphasis on ALL of an older adult's behavioral health needs, including dementia. Stakeholders say that informal caregivers need to be integrated into planning and treatment for specific populations with dementia and that integrated, multi-disciplinary treatment should support family caregivers to the extent possible. Stakeholders also say that formal, paid caregivers need to be included in care planning for consistency in communication with health care providers and in follow through with care. The Task Force noted that there is a need to integrate informal caregivers in planning for the broader population with dementia, but it is not clear what additional actions could be undertaken to target these specific populations with dementia. Work is underway to examine patterns of caregiving for Alzheimer's by African-Americans and Hispanics. It might be useful to examine the inclusion of informal caregivers, as appropriate, in the patient care plan in medical home models. Stakeholders are concerned about the skill and availability of direct care workforce-caregivers. The Task Force recognizes the need for an expanded and stable direct care workforce to support the needs of an aging population, including the specific populations addressed in this report. Training, adequate compensation, vigorous recruitment, support, and retention are areas to pursue, with a recognition of the unique needs of specific population and the necessity of building in communication between direct care staff, family, health care provider, and individual with dementia. CGEPs are already working in this area, but much work remains to be done. For the following recommendations, the Task Force identified work that is currently underway that will address the issue. Stakeholders say that providers of health and long-term services and supports (LTSS) need more access to dementia awareness and training activities. Stakeholders recommend that these activities be developed, promoted, and carried out. The CGEP funds schools of nursing, health care facilities, and programs leading to certification as a nurse assistant who will serve elderly persons. Through this program, grantees develop and disseminate curricula relating to the treatment of geriatric health problems, train faculty members in geriatrics; provide continuing education to individuals who provide geriatric care, or establish traineeships for individuals who are preparing for advanced education nursing degrees in geriatrics. Many of these grantees provide inter-professional training on Alzheimer's disease including specific populations addressed in this report. The Geriatric Academic Career Award (GACA) supports career development of physicians, nurses, social workers, psychologists, dentists, pharmacists, and allied health professionals in academia to provide training in clinical geriatrics including the training of inter-professional teams of health professionals. 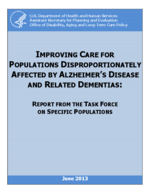 Current programs support training related to Alzheimer's disease including specific populations addressed in this report. The GECs provide inter-professional geriatric education and training to health professionals and others students. This includes training on the latest clinical guidelines and information on how to work with people with Alzheimer's disease and their families. Health care providers learn how to manage the disease while coordinating care in the context of other health conditions, and how to link people to support services in the community. Training also addresses caregiver burden and depression. Health care providers are also trained on the tools available to detect cognitive impairment and appropriate assessment processes for diagnosis of Alzheimer's disease and related dementias. All of the GECs received supplemental funding in FY 2012 to provide inter-professional training on Alzheimer's disease and related dementias including specific populations addressed in this report. The GTPD supports geriatric training projects for physicians, dentists and behavioral and mental health professionals who plan to teach geriatric medicine, dentistry, or behavioral or mental health. All grantees provide training on the assessment, diagnosis, treatment, management, and evaluation of Alzheimer's disease and related dementias, including specific populations addressed in this report. All grantees also provide training on the broader issue of mental and behavioral health among older adults. It is important that providers are aware of these and other training opportunities and that training be widely available to providers, including those who are knowledgeable about specific populations but who do not typically serve people with dementias. Opportunities to maximize current training programs may be further promoted and refined for specific populations through existing efforts or realigned efforts including those of HRSA, ACL, and the Centers for Medicare and Medicaid Services (CMS). For example, there may be opportunities to partner with the private sector through the University Centers for Excellence in Developmental Disabilities (UCEDD), a network created through AIDD and the Developmental Disabilities Assistance and Bill of Rights Act of 2000. Other private sector entities, with specialized knowledge and skill regarding specific populations, may be engaged in training and information dissemination. Stakeholders recommend that there be a registry for those with Down syndrome and dementia. NIH has an existing registry for those with Down syndrome and dementia. Stakeholders may need additional information about this registry to be disseminated to their networks. Stakeholders suggested several general and specific areas for research regarding specific populations. A meeting to develop research priorities around Alzheimer's disease and Down syndrome is scheduled for May 1-2, 2013, at NIH. Other suggestions for research have been shared with NIH. Stakeholders assert that there is potential for exploitation of specific populations in clinical trials and other research approaches and safeguards against exploitation need to be woven into research procedures. Discussions with the National Human Subjects Research Council and the NIH Office of Ethics in Research are important to address these efforts. Additional information may be found through the Alzheimer's Association which has developed an ethics statement for research participants: http://www.alz.org/documents_custom/statements/protection_of_participants_in_research.pdf. Stakeholders point to a lack of person-centered planning and recommend that programs and policies employ person-centered planning to the extent possible by pulling culture and family into this process. The Task Force noted that person-centered planning is the central approach that CMS, ACL, Indian Health Service (IHS), and VA are applying to many of the programs they fund. This issue is not limited to dementia only. All federal agencies could consider whether modifications are necessary to take into account cultural issues and family caregivers and educate providers and their networks accordingly. Stakeholders say that family members of persons with dementia should be encouraged to seek certification as providers under their state Medicaid waiver program. This step would enable family caregivers to receive payment for the care they deliver as part of a Medicaid HCBS plan. In many state Medicaid programs, it is possible for a family member to become certified as a provider through the state Medicaid system. The Task Force sees the potential opportunity for the private sector to support the dissemination of this information where appropriate. The Task Force will forward the recommendation to the National Resource Center for Participant-Directed Services for consideration in its work with state LTSS programs. Stakeholders recommend use of the medical home model for specific populations to increase their regular and appropriate access to health care. The Affordable Care Act (ACA) offers opportunities to expand access to the "health home" which expands "medical home" to access a range of community supports. This issue is broader than dementia. Stakeholders emphasized that maintaining typical home and community living was important to specific populations with Alzheimer's disease and related dementias and to their families. Given the history of segregation and discrimination [some] people with intellectual disabilities and their families have encountered across the lifespan, additional attention and vigilance in ensuring appropriate access to community living for this population is warranted. This attention should include alignment with the 1999 Olmstead Decision. Among all populations, family, culture and language must be factored into decisions of care within the community as well. HHS is sensitive to this concern and strives to ensure access to the least restrictive environment for all people. Stakeholders state that persons under age 65 with dementia must wait two years for Medicare once they are determined eligible for Social Security Disability Income and their families are not eligible for Medicare even after the waiting period is over. Stakeholders recommend that policies and programs address issues of access to health insurance coverage for persons under age 65 with dementia and their families. This need is being addressed through the ACA as people with younger-onset dementia will have access to expanded Medicaid or through the full roll out of the Affordable Insurance Exchanges. Implementation of ACA will also result in limiting exclusions for pre-existing conditions beginning January 1, 2014, addressing a concern of people experiencing younger-onset and their families. The Task Force noted that the following recommendations, while very important, are beyond the scope of the National Plan and/or require action by groups outside the executive branch of Federal Government. Stakeholders assert that ethnic and racial minorities, particularly those who are undocumented, need better access to health insurance coverage as the ACA is implemented and recommend that this issue be addressed. This recommendation is beyond the scope of the National Plan. Stakeholders say that practitioners do not have reimbursement for services they provide to caregivers and recommend that practitioners' reimbursement be adjusted to address this. The Task Force notes that the non-federal members of the Advisory Council on Alzheimer's Research, Care, and Services made a recommendation on this about the broader population of caregivers for people with Alzheimer's disease and related dementias. This issue is shared across all populations with Alzheimer's disease. Stakeholders assert that specific populations need better access to transportation to facilitate access to health care as well as social supports. Although the Task Force recognized the importance of transportation to the receipt of timely health care, challenges with transportation are beyond the scope of the National Plan.